Image: Chiura Obata, Grand Canyon, May 15, 1940, Watercolor on silk, Amber and Richard Sakai Collection, courtesy UCSB ADA&A Museum. UCSB Art Design & Architecture Museum has three terrific winter exhibits opening this month. Chiura Obata: An American Modern is on view Jan. 13-April 29 and features the work of Chiura Obata, one of the most significant Japanese American artists of the last century. Also on view during that same time period is Jane Gottlieb Photographs France, featuring the vibrantly colored, energetic cibachrome vision of Jane Gottlieb, a local artist whose work has been exhibited widely and featured in Santa Barbara Seasons. Also opening on Jan. 13 and on view through April 1 is art by the late Keith Puccinelli, whose renowned work has been featured in Santa Barbara Seasons and who recently passed away. The opening reception for all shows takes place on Jan. 12, from 5:30–7:30 p.m. at UCSB Art Design & Architecture Museum, 552 University Rd., UCSB. Born in Okayama, Japan, and working primarily in California, Obata emigrated to the U.S. in 1903 and embarked on a seven-decade career that saw not only the growth of an international American art but also xenophobic laws and the mass incarceration of Americans of Japanese descent during World War II. Obata emerged as a leading figure in Northern California’s art scene, serving as an influential art professor at the University of California Berkeley for 22 years, and as a founding director of art schools at the Tanforan Assembly Center in California and the Topaz Relocation Center in Utah during the Japanese American Internment (1942–45). Chiura Obata: An American Modern surveys Obata’s rich and varied oeuvre, featuring more than 150 superb works of art, many of which have never been on public display. Drawing from private and public collections, the retrospective showcases representative works from every decade of Obata’s career and presents them under thematic groupings in a loosely chronological order. The many smaller, never-shown works in this retrospective illustrate Obata’s tireless pursuit of better techniques and devoted appreciation of the detail of everyday life. sublimation print on aluminum, 40 x 60 in. Jane Gottlieb is a photographer living in Southern California, where she was born and raised. In her early 20s she made her first trip by herself as a young professional to Paris. The images she took then, and in many subsequent trips, have been a touchstone of her life’s work. She has returned to them again and again in the last decades, changing them progressively to meet her vision of France as the technology available to her has advanced. Gottlieb’s vision of France is not like anyone else’s. It is riotous in color, hyper-vibrant in energy, and deeply Californian, shot through with a purely Mexican palette. When she discovered the possibility of hand painting cibachrome prints she had the tools to change the world to match her vision. Printing from her library of color slides, she could brighten them up and give them a new exciting life. The possibility of saturated, unrealistic color was released from Pandora’s box, not to cause trouble but to irritate the eye like a grain of sand in an oyster, producing pearls of perception. The exhibition includes 20 works by Gottlieb, which survey both the development of her techniques and the specific motifs she has concentrated on in France. The photographs range in date from the late 1970s to the mid 1990s, and the prints from the early 1980s to the present. In addition, the exhibition includes, by way of contrast, late 19th-century photographs and postcards, which express the typical way photographers and visitors have viewed France, and highlight the originality of Gottlieb’s images. With the cibachromes and then her digital prints, the power of Gottlieb’s vision has been widely recognized. Her work has been exhibited internationally and locally, from Basel, Lisbon, London, Paris, Rome, and Milan, to New York City and Denver, and in Los Angeles and Santa Barbara. Gottlieb’s work resonates across a broad range of viewers and interests. Keith Puccinelli, Chesire Cat, 1998, ink on paper, 6 x 4 in. To announce the extraordinary gift of works and an archive by Keith Puccinelli as well as the recent establishment of The Frances Garvin and Keith Julius Puccinelli Endowed Fund, the AD&A Museum is mounting a celebratory exhibition. Featuring Keith Puccinelli’s work and selections from the couple’s personal collection, this exhibition is a modest installation in anticipation of a larger, forthcoming presentation of this incredible donation. Including a selection of Keith Puccinelli’s drawings, sculptures, sketchbooks, graphic designs and art by local and international folk artists, this installation underscores how this couple, recently deceased, lived an inspired, creative life. Admission to UCSB Art, Design & Architecture is always free. The Museum is closed Mondays and Tuesdays and open to the public from noon-5 p.m. daily, except Thursdays, when it is open from noon to 8 p.m. Originally published in Santa Barbara Seasons on January 7, 2018. This age-old folk tale involves creative thinking, a con job and community sharing with disparate items brought together to create something for all to enjoy. The same is true of The Can(n)on Art Studios and the five studio mates— Elizabeth Folk, Rafael Gaete, Kimberly Hahn, Marco Pinter and James Van Arsdale—who created the work on view in this exhibition. Established in 2010, The Can(n)on Art Studios in Goleta provides an affordable, open-floor-plan studios for local artists and a community-minded workspace. Periodically, the Can(n)on showcases guest artists, lectures, and open studios. 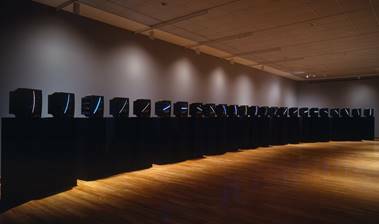 Though there is this collective aspect to The Can(n)on, each artist produces unique work in diverse media, styles and conceptual frameworks that engage in the contemporary art dialogue. The show will include Folk’s video and sculptural work, Gaete’s abstract oil painting, Hahn’s photographic and Pinter’s interactive installations, and Van Arsdale’s mixed-media works and opening night sound/music performance. This exhibition features the work of active artists involved in the Santa Barbara contemporary art scene. A public reception will be held at the Arts Fund Gallery (205-C Santa Barbara St.) on Friday, April 1 from 5-8 p.m. during the Funk Zone Art Walk, with a special performance by Heavy Cosmic Kinetic. The exhibition will be on view until May 21. Regular gallery hours are Wednesday-Sunday from noon-5 p.m. The exhibition is free and open to the public. Originally published in Santa Barbara Seasons Magazine on March 29, 2016.